Today is the feast of St. Wenceslas (or Wenceslaus) whom we usually think about at Christmastime thanks to the much-loved carol “Good King Wenceslas.” Actually, St. Wenceslas, was not a king, but a duke — though one filled with the royal virtues of charity and humility and finally, crowned with martyrdom. Born around 903, he was the product of what we call a “mixed marriage.” His father, Wratislaw, was a Christian and his mother Dragomir, a pagan. 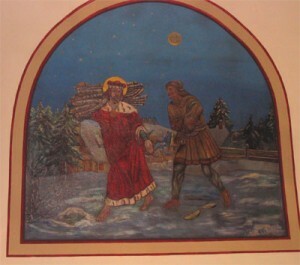 Wenceslas was brought up with a strong Christian faith by his grandmother, St. Ludmila, while his younger brother Boleslaw was schooled as a pagan by his mother. The contrasting infuence of these two women could hardly have been more portentous. When Wratislaw died, Dragomir became the regent, since her son, the heir-apparent, was only about 13 years old. The anti-Christian forces saw this as their opportunity to consolidate power. While Ludmilla tended to the spiritual formation of the boy, Dragomir plotted to get control of him and had Ludmilla strangled to death. Then Dragomir used her power to insist that young Wenceslas participate in pagan rituals. One can only imagine the risks he took at this time to assist at clandestine nighttime Masses. As the goodness of the young duke came to light, so did the nefarious plotting of Dragomir. Finally the outraged populace deposed and banished her and urged Wenceslas to take the reins of power, even though he was barely out of his teens. Wenceslas was very pious; he took a vow of virginity and was known for his virtues. He strengthened the churches in his area, bringing in more priests, and concerned himself with the welfare of the poor. He prepared the elements for the Mass with his own hands, served the priests at the altar, and spent hours in daily prayer. In a couple of critical situations involving adversaries, angels were seen to accompany him. With God’s command to honor his father and mother in mind, he called Dragomir back from exile. She, however, incited Boleslaw to murder him on September 28, 935. Wenceslas was hacked to pieces and his body buried at the murder site. Three years later Boleslaw repented and had the body transferred to the Church of St. Vitus in Prague.